A moving meditation practice, Qi Gong helps you clear away emotional stresses, develop balance and harmony with Nature and within, and nurture health and vitality from the inside out. Used for over 4,000 years for health maintenance and illness prevention, Qi Gong gives you the skills and resources to treat issues such as fatigue, pain, depression, insomnia and more. 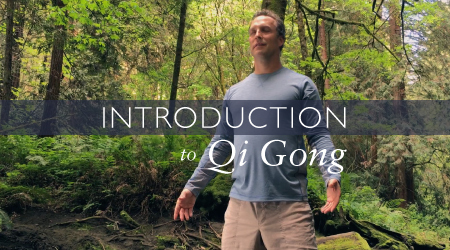 Qi Gong is a time-honored practice that focuses on health, relaxation, energy, and vitality. Described as the art of effortless power, Qi Gong is easy to follow, accessible, and effective for treating our most common alignments in modern life.Combining gentle stretching, energy activating exercise, simple movements for strength, and flowing movements, Qi Gong gives a complete body/mind workout. As part of an ancient medicine that focused on prevention, Qi Gong was often used to treat our most common ailments, like stress, pain, fatigue, depression, insomnia, and much more. Qi means energy. Think of it as an electrical system. Every system in your body needs energy. Your heart, for example, is an electrical pump. Your nervous system and spine conduct a tremendous amount of energy communicating mind to body and body to mind. If the wires in your house get frayed, the appliances don’t work. When the Qi in your body is blocked, the systems don’t run smoothly. This practice will help to insure that all parts of your body have a fresh supply of energy.